The past couple of months have seen me running around like a mad fool playing Touch Rugby with and against players who are, in some cases, more than half my age. If that's not the sign of a mid-life crisis, I don't know what is. However, someone well past any semblance of middle age is Japanese rugby player Sadayoshi Morita who was (when this was first reported in 2005) a sprightly 90 years old. 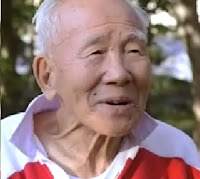 Recognised at the time by the Senior World Rugby Championship as "the world's oldest practising rugby player," Morita had been in training for rugby matches at least three times a week for the past 70 years and had been playing rugby for most of his life, barring the three years he was conscripted by the Japanese Imperial Army during World War Two. I've no idea whether he's still playing, or even if he's still alive at 92, but two years ago he said that we wanted to keep playing until he was 95 when he would retire and concentrate on his golf - because that would not require him to run at full speed all the time. Priceless! For a video clip of Mr Morita in action click here. There is, however , another possible claimant to Mr Morita's title. 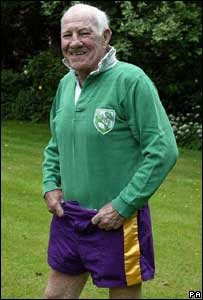 Last summer Englishman Desmond Pastore was awarded an MBE for services to rugby, having played his last game on his 91st birthday. His 75-year career included a stint as captain of the England services side after the Second World War. 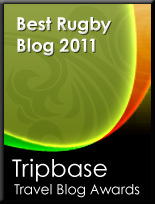 He then returned to the North West to join Sale where he set a try-scoring record. Mr Pastore played his final game for Manchester club Egor in September 2005. "They let me on for half an hour and I scored a try," he said. Mr Pastore is credited with devising the system where the colour of the players' shorts indicated their age. He said it helped veteran rugby players, as he himself wore purple shorts, indicating to the other players not to commit full contact tackles. "It never occurred to me not to play," he said. "I was fit, and I was wanted, so there seemed to me no point in not playing."